We had planted a beautiful Hawaiian Ti (Cordyline terminalis) before, probably about a decade ago. It grew from a stem cutting (also known as ‘log’) that was presented by a dear couple who returned from holidaying in Hawaii then. But was eventually discarded when it became leggy and unsightly. 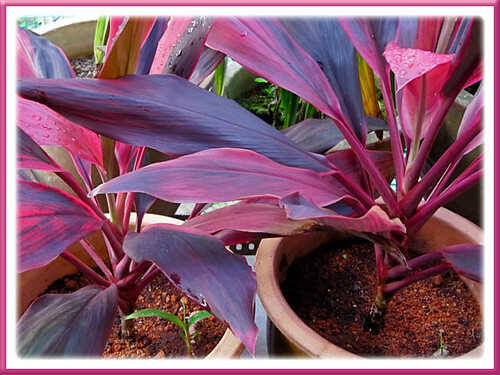 Seeing a vibrant variegated pink/maroon beauty during our recent vacation to Felda Residence Hot Springs, Sungkai in Perak, has surely rekindled in us a strong yearning for one! We’ve searched high and low for the same variety in Kuala Lumpur but not a single one was to be found in some of the garden nurseries we visited. Even Ti Plants of other varieties for sale were sickly-looking, not value for money at all! Our next best alternative will be to scout for a stem or two of a Ti variety that is popularly grown in home gardens, roadsides and elsewhere and propagate some plants, ourselves. Lo and behold, while cruising around the neighbourhood last week, we saw a beautiful and attractive stand-alone red/maroon Cordyline bush, growing beside a telephone pole on no-man’s land. A couple of wild creeping vines sort of entwined the whole bush, yet it stood luscious and majestic, surrendering to our tropical heat and rain, and poos from stray dogs too (eeek…I almost stepped on them), to provide for its growing needs! Of course we came prepared with a pruning scissors the second time around and happily snipped 2 healthy stems to take home to propagate some Ti Plant for our tropical urban garden. 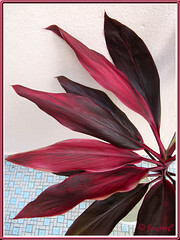 This Cordyline terminalis has leaves variegated in red and pink tones, and dark maroon with a greenish tinge. Another gorgeous and stunning Ti variety that is widely and popularly grown. 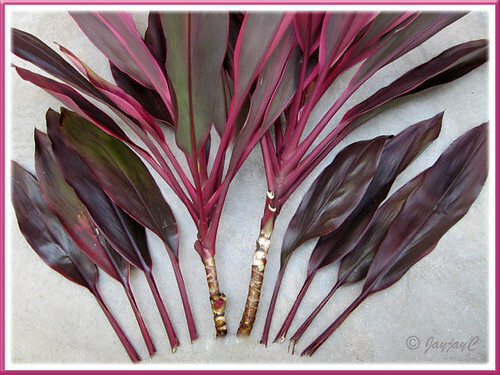 Thus, for January’s garden article, we’d simply share how Cordyline terminalis (Hawaiian Ti or Ti Plant) can be propagated. Propagation from tip cuttings or stem cuttings is the easiest method and can be started in the soil or in water. We chose the former, being the easier and faster way. Cut back any healthy stem of a matured leggy plant with a sharp pruning scissors or knife. The remaining bottom trunk will continue to grow and should sprout new shoots. From the severed stem cutting, cut off a tip cutting 10 cm below the crown of leaves, and cut the remaining leafless stem into 10-cm section cuttings. 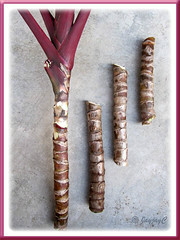 first, carefully remove some of the lower leaves to leave a section of bare stem about 10 cm. long. Then, insert the tip cutting into the pre-moistened potting media that can hold moisture, yet provides good drainage and aeration. Gently firm the soil around the stem and place the pot in a warm and brightly lit (with filtered sunlight) location. With sufficient heat, regular watering and misting of leaves, rooting shouldn’t be a problem at all. Note that tip cuttings usually require intermittent misting until sufficient roots are produced to prevent necrosis of leaf tips or leaf drop. 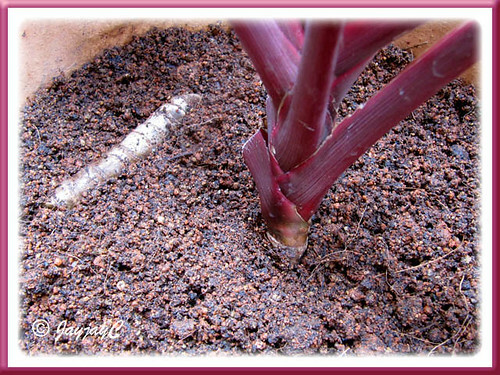 just stick the 10-cm stem cuttings, vertically into a pot with appropriate potting media. When top growth appears, pot them individually. Alternatively, the section cuttings can be laid down horizontally in moist soil, by gently pushing half into the soil and exposing the remaining half lengthwise. Locate in a sunny area and keep the soil damp. 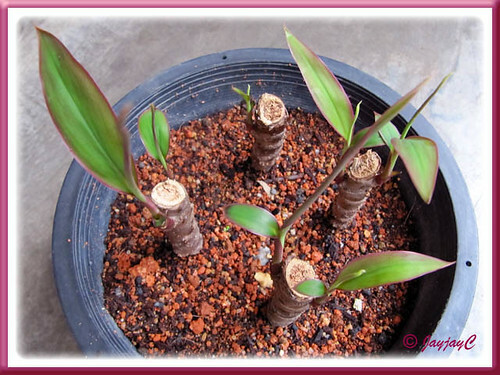 When new growth appear along the sections and root, you can cut them off to plant them as individual plants. 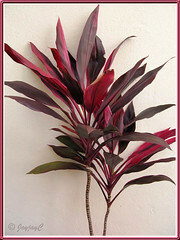 Check for plant profile on Cordyline terminalis (Hawaiian Ti or Ti Plant) here. A couple of basal leaves from plants propagated by tips cuttings had since dried up and withered which is usual, while the rest of the foliage is growing nicely with new leaves emerging. Those propagated by section cuttings that were pushed into soil or laid horizontally are growing fine with young shoots of green leaves. Hello there, I also love cordelines, and have propogated plenty the way you describe! Have you noticed though, that sometimes the leaves are brighter? I am not convinced that it is truly a light and shade issue (they do seem more colourful if they get some sunshine, but not too much) I have been wondering if it is fact something in the soil that affects their colouring? Maybe PH? Hi Jacqui, have not heared from you for awhile. 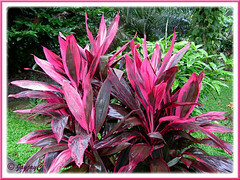 I have lots of Cordyline you are looking for, come and you can have whatever you want. haha! We sometimes just cut and throw them away, it’s getting crowded and ugly looking in the corner of the property. Gillian: Thanks for visiting and sharing your insights. Not sure whether soil PH affects its colors, though I’ve read that it does for Hydrangeas. Andrea: due to time constrain, my friend. I’ve been busy with my relatively new blog, Jacq’s Blogger Tips and learning much in the process of experimenting new features in Blogger, something I enjoy very much too besides gardening. Great, if we’re a couple of miles apart…then I can just drop by to salvage what you’ve discarded, haha! One man’s trash is another man’s jewel, huh! Actually Im not a fan of Ti plant, but after seeing your work, I suddenly desiring for one. There are many Ti plants growing in abandon areas and with many types of varieties – it will surely make a coloured variation. Indeed, James…grouping a few varieties together will display a splendid kaleidoscopic scene! Thanks for dropping by. Have a wonderful week, dear friend! I have a Hawaiian Palm that has rotted in the middle,It has broken in half, can I still cultivate this somehow? I also have an outdoor plant, which I only know is called Lisa. It looks like lanterns when it is in bloom. However the lanterns have now gone brown and see through and inside it looks like a red seed, and I wanted to know how to cultivate it? Thank you so much for your terrific propagating explanation. When I was a little girl my Grandmother presented me with a Ti plant log, which began my love for plants. It’s now 44 years old, about 7 feet tall, and in such a big heavy pot, that it is burdensome to bring in for the winter. Your explanation was simple, yet detailed enough to give me confidence that I can establish in several pots, with multiple methods and have complete confidence of survival. You’re most welcome, HDC! Thanks for your kind feedback…we really appreciate your effort. Happy gardening and all the very best to you. Thanks so much for your work on this writeup. I purchased an existing plant in a clearance rack at a grocery store, only because I wanted a plant on my desk at work. It promptly lost all of the leaves it had (only three to start) and I started looking to see if I could save the plant. I’m going to lay the ‘log’ over on its side and see if it sprouts like the one in your picture. BTW, would love to see an updated picture of the new starts! You’re most welcome, Nathan…our pleasure really in sharing! Wish you all the best in getting your log to sprout. I’m rather surprised to observe that new plants started from the logs laid horizontally grow ever so slowly (up to 11 inches only as of today) as compared to those propagated from tips cuttings which have reached 5 feet tall. I don’t have the latest picture, but have one taken last November of a section of our frontyard that included the 2 pots of the new starts as posted at http://www.flickr.com/photos/jayjayc/5226089463/ (on the left side of image). Check it out so you can see the extreme difference in height as mentioned. I found that if you dip the top part of the stem (after you have cut it into several lengths) you take and dip tips in wax. Any wax will do. I use candle wax. this helps to seal the plant and keeps it from rotting out. Yes ph and sunlight have a lot to do with a coloring of a plant. 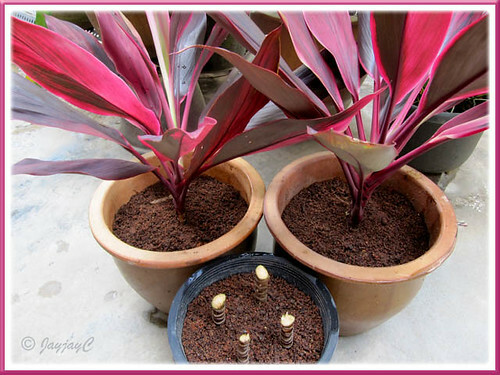 I found that when I take the sister plant, dracenea magenta and just stick it down into a bucket of water it will get roots after a few weeks. Or I have heard of people just placing it in the ground and watering it well for a month. You’re most welcome, Sandy! Great to know that you’ve found this article helpful. 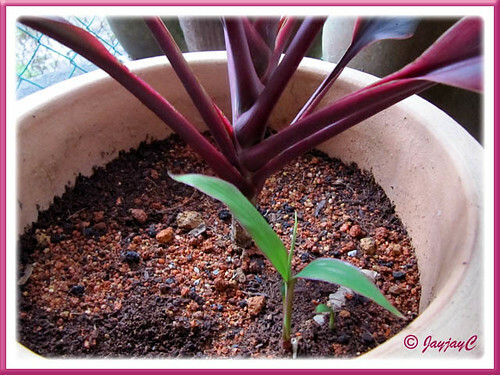 Thanks for sharing your experience of ridding your plant of pests. Re discussion of other plants, I’d suggest that you explore further our A-Z Plants Photo Gallery to select the plants that interest you and click on the thumbnails to lead you to the related post containing plant profile, culture, etc. So happy to have found this site as I’m new to this type of plant but absolutely love it. Had no idea why I bought a plant I wasn’t sure I could actually care for. Thank you for such great help, even for my brown thumb,lol!. Though I have one question. I have my plant in full sunlight on a cement patio, do you think it’ll be okay there or is it better to move it more towards a shady area?. Thanks again and happy planting!. Hi Darlene! A slightly shadier location with morning sun is preferable. Though Ti Plants need sunlight for best growth and foliage colouration, direct or full sun all day long may scorch its foliage. Great to know that, Kelly. Have a lovely week ahead! In my opinion, just roots alone without its stem will be a flop. But if you have the stem cutting, just dip the bottom-end into a rooting compound and plant it straightaway into the potting mix, vertically with the top-end above the soil. All the best… hope the stem survive! Hi Im interested in creating a gardening blog. I was wondering if you make money off yours. Id like to be able to make enough to pay for the fees to run the blog.